Photo Caption: HRH The Duchess of Cornwall (front) presented the medals as the Greenwich Park Eventing Invitational (CIC**) drew to a close in London (GBR) today. 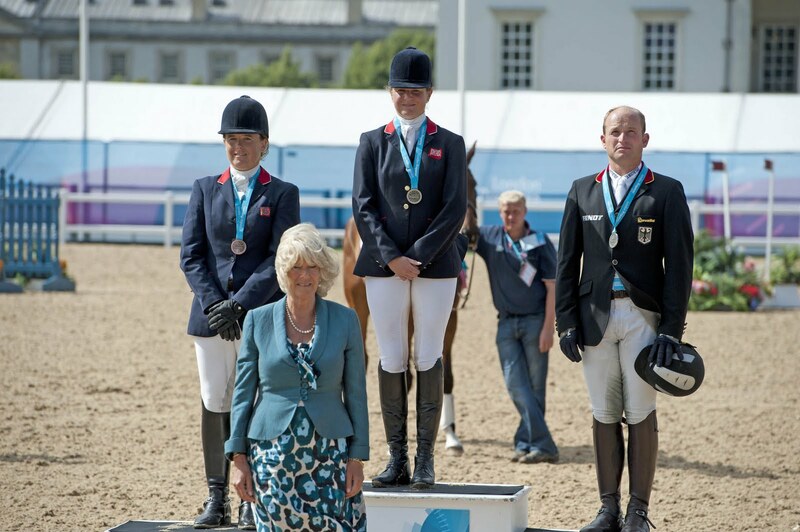 Pictured on the podium (left) Great Britain's Pippa Funnell who finished third, (centre) winner Piggy French from Great Britain and (right) second-placed Michael Jung from Germany. Photo: Kit Houghton/FEI. Great Britain's Piggy French held firm to scoop the honours in the Greenwich Park Eventing Invitational (CIC**) today with a fabulous double-clear jumping performance from DHI Topper W. Germany's Michael Jung (River of Joy) finished second ahead of Britain's Pippa Funnell (Billy Shannon) in third, but all the athletes were in agreement that the real winner of the Olympic Test Event has been Greenwich Park, the fabulous London venue which will host next summer's Olympic equestrian events. "Of course it was special to win here - we are all competitive and it was great for a British rider to put a stamp on it - but this has really been about checking things out before next summer's Games and from that point of view it's been a huge success", said French this afternoon. In the lead from the outset on Monday, she had a heart-stopping moment this morning when DHI Topper W was held over during the final horse inspection, but in the end nothing could prevent her from claiming the top step of the podium. A total of 35 riders lined out in the final jumping phase, but just 12 managed to stay clear first time out. Sweden's Sara Algotsson Ostholt lost her grip on second spot with a single mistake from her talented young mare, the seven-year-old Mrs Medicott, and Clayton Fredericks, lying overnight fourth for Australia, slipped from contention when Bendigo did likewise. This allowed Michael Jung to move into runner-up spot, but French had a fence in hand as the closing stages were played out. Funnell, now in third with the handsome Kannan mare Billy Shannon, piled the pressure on the two ahead of her with a lovely tour of the second-round track. Jung didn't flinch to stay clean and the pressure was all on French when last into the arena. Setting off in a quiet rhythm however the 30-year-old rider calmly held her nerve to take the win she well deserved. "Topper has matured so well over the last few months - he could be a contender for next year”, French said afterwards. “That's still a long way away and horses are great levellers so who knows what can happen between now and then, but I reckon he's got what it takes. I just hope we haven't peaked too early!" Funnell said she was "thrilled to bits" with her horse's result, but even happier about the "positive vibes" that have come out of this event. "For me the highlight was talking with the school-children yesterday. They were so enjoying what they were watching, they were excited by the sport, not by the personalities because they didn't know who any of us were. Much as I love Windsor and Blenheim and all our top venues I just know that this is the right place to stage the Olympics. It's a great opportunity for us to show people that our sport is not elitest and that we really enjoy meeting new people and helping them to experience our sport", she added. Her sentiments have been echoed time and again over the last few days. The Greenwich event also incorporated demonstrations by Jumping, Dressage and Para-Dressage riders. Despite still suffering the consequences of a broken jaw when her Olympic ride, Cedric, hit her with his head during the recent Global Champions Tour in Monaco, America's Laura Kraut was beaming with delight after finishing second to Britain's Nick Skelton in today's Jumping test. "It's just so exciting for us all to be here and to be part of it all", she said. "Other than Barcelona we've been out on a limb at most of the other Olympic Games but here the equestrian competitors will be right in the middle of everything - and what a place the Park is!" she added. “It didn’t feel like we were riding on a platform”, she said. She agreed with some of the other Jumping riders that the footing in the arena needed some improvement, which she understood would happen for 2012. British Dressage star, Laura Bechtolsheimer, is also looking forward to next year’s Games at Greenwich. "It’s such a fantastic opportunity for our sports to be at the heart of the Games. As a competitor it means I’ll have a true Olympic experience and stay with athletes from around the world and many other sports. And it’s also great for us to reach a new audience and increase interest. I'm keeping my fingers crossed for a smooth build-up with Alf (Mistral Hojris) - we (Britain) have our strongest team ever and it's our best chance of standing on that podium", she added. The British athletes under the most intense pressure next year however may be the Para-Dressage riders who got their chance to check out the main arena atmosphere yesterday. "We've won gold so many times that there huge expectations out there!" said Amanda Bond, Chief Executive of British Dressage and Paralympic Advisor for LOCOG today. "The spectators were amazed to see our riders in action. They coped really well in the arena and it was great to have visibility like this for our sport", she said. From an organisational perspective, the last few days have provided a bank of information and ideas that will be sifted through in great detail as de-briefing takes place. Tim Hadaway, LOCOG Equestrian Competition Manager, said today that comments from competitors and everyone else involved in the event will all be taken on board. FEI Secretary General, Ingmar de Vos, congratulated the Test Event team and volunteers for doing a great job. "So far we've had good feedback from the media and spectators - things can be improved but that is what a Test Event is for, so we can find out the areas that need improvement and get down to it", he added. Final Results: 1, DHI Topper W (Piggy French) GBR 34.70; 2, River of Joy (Michael Jung) GER 41.80; 3, Billy Shannon (Pippa Funnell) GBR 44.90; 4, Bendigo (Clayton Fredericks) AUS 46.10; 5, Mrs Medicott (Sara Algotsson Ostholt) SWE 46.60; 6, Nepal du Sudre (Virginie Caulier) BEL 50.80; 7, Borough PennyZ (Vittoria Panizzon) ITA 56.40; 8, Chuckelberry (Joseph Murphy) IRL 58.60; 9, Pivoine des Touches (Donatien Schauly) FRA 60.00; 10, Gaucho (William Fox-Pitt) GBR 60.30; 11, Sir Medicott (Frank Ostholt) GER 60.90; 12, Lamicell Unique (Karin Donckers) BEL 61.10; 13, Blockbuster 11 (Waylon Roberts) can 62.00; 14, Limestone (Joris Vanspringel) BEL 62.10; 15, NZB Campino (Mark Todd) NZL 63.10; 16, Furst Love (Alex Hua Tian) CHN 64.50; 17, Viscount George (Andrew Nicholson) NZL 64.60; 18, Let it Bee (Kathryn Robinson) 65.60; 19, Paulank Brockagh (Sam Griffiths) AUS 69.60; 20, Cavalor Telstar (Raf Kooremans) NED 69.60; 21, DHI Colour Candy (William Faudree) USA 70.10; 22, The Only One (Jayne Doherty) IRL 70.50; 23, Olipper Schervil (Denis Mesples) FRA 70.90; 24, Gunstone Wallstreet (Julian Stiller) USA 71.40; 25, Incognito (Clarke Johnstone) NZL 73.10. Not qualified for top-25 second round - 26, Lit-Il Peccau CH (Benoit Johner) SUI 68.50; 27, Hooligan (Takayuki Yumira) JPN 71.10; 28, Idaho D'Argonne (Ruy Fonseca) BRA 80.00; 29, Carlow Miller (Paul Hart) RSA 87.70; 30, Culture Couture (Samantha Albert) JAM 89.40; 31, Jabadaba Doo (Andreas Riedl) AUT 90.80; 32, Jaybee Star Celebrity (Logan Rawlings) USA 101.70; 33, Jazz King (Nina Ligon) THA 102.10; 34, Rongotai (Renan Guerreiro) BRA 119.80; 35, Libro Archie (Brian Nunez-Hughes) COL 140.30. The winning horse, DHI Topper W, was held over during the final horse inspection but passed on further examination. Killossery Harvey, ridden by Jaroslav Hatla from the Czech Republic, was withdrawn. Irish rider Joseph Murphy rocketed up the leaderboard from overnight 18th place to finish 8th with Chuckelberry. This combination were in 26th place after dressage. Great Britain's Nick Skelton won today's Jumping Demonstration Competition riding Carlo. Michael Jung, giving his impression of the test event - "It's been really nice for the horses, the stables were quiet so it was easy for them to relax. The cross country was really hard so we know we must train a lot for next year - there were many big hills - for dressage and jumping the ground was good". Pippa Funnell, talking about her experiences this week - "It's a huge advantage to get a feel for the terrain - the cross country will be a serious test next summer". Amanda Bond, talking about the experiences of the Para-Dressage riders - "In Hong Kong we were a three-hour flight away from where everything was happening - it's going to be great to be so close to all the other athletes here in London next year. Everyone is really looking forward to it".